I jump, grab a red paper light fitting, swing across the room and boot the first mook through a flowery paper wall, I roll with the momentum over a sloshing fish tank and connect my fist into the face of another. Wushu Open is an action movie roleplaying game system. A system that encourages you to do that. A system that rewards you for doing that. Wushu Open is the no-frills-and-free, creative commons version of the commercial-but-indie Wushu system. Ideal for action movie settings from Hong Kong action theatres to derivatives such as the Matrix. The rulebook is plain but I implore you to forgive that and read it; as the system breaks preconceptions in the most mind shattering manner. Daniel demonstrates that realism isn't always good. In most systems realism causes negative modifiers to outrageous acts of heroism. Negative modifiers make cool stuff less likely and so players are rewarded less. A good point, I think. I've certainly seen the benefits of chaining up reality in the cellar when playing with my Shared Pool system. In Wushu, the core mechanic is based on that principle. It's a core mechanic, you say? I jump, grab a red paper light fitting [D6], swing across the room and kick the first goon through a flowery paper wall [D6], I roll with the momentum over a sloshing fish tank [D6] and connect my boot into the face of another mook [D6]. My pool is 4 dice. The GM and player decide what a die-worthy detail is and you limit the number of dice to speed up or slow down a scene (for dramatic effect). I find that this kind of reward works brilliantly with players who are engaged at the table as there is a tangible benefit for coming up with entertaining and interesting actions. When in combat, you fight Mooks and Nemeses. Mooks can be dispatched without an opposed check and damage ticks down their "Chi" as a group. When Chi runs out, the remaining Mooks take to their heels or are all unconscious or realise they're the bad guys and surrender. Either way, the scene moves on. Nemeses are taken on mano-e-mano basis. Nemeses are like player characters. When rolling combat, you split your dice between attack dice for doing damage (called Yang) and defence dice for soaking up damage (called Yin). Every success removes a point of Chi until you're exhausted. Choosing a balance between Yin and Yang gives a clever tactical choice. As damage relies on narrative, you can choose whatever weapons fit your character and the setting. There is no initiative or advancement either. Your character begins with a Weakness trait that gives your character depth too. Wushu Open feels unfinished. The system itself is complete but as a game, it needs expansion to get over that hump to finished. And here lies the difficulty: if the free game was complete then there would be little need to buy the full price game (which isn't expensive). I would like more examples, an evocative layout, sample adventure, contents page and some images. The reviewer runs up a chair onto the table and launches a simile laden paragraph at one reader while slapping the foundations of another. As the game has a Creative Commons variant, so there is no reason that someone else couldn't take Wushu Open and make these updates. 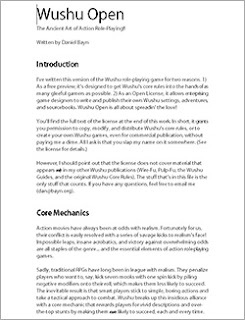 However, you could well argue that a well put together Open redux would affect sales of the core Wushu game; as the sort of person who would do a redux, I would not like to sour Daniel's goodwill. This issue is not unique to Wushu Open but any free RPG that is shoulder to shoulder with a paid product. I regularly red "GMs should reward the players for imaginative play" and although experience points can serve that purpose, Wushu uses that tenet as a cornerstone. To demonstrate the opposite, Wushu penalises players who do not engage at the table. How many games can claim to that? Wushu is a novel system for action movies and is worthy of its following. Mutants and Machineguns is a modern world political drama set in the West Wing of the Whitehouse. Ha! Only joking. Had you fooled for a moment there. Didn't I? No? Oh. 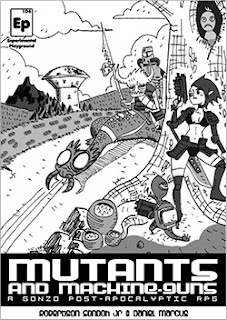 Mutants and Machineguns by Robertson Sondoh Jr and Daniel Marcus does what is says on the tin. 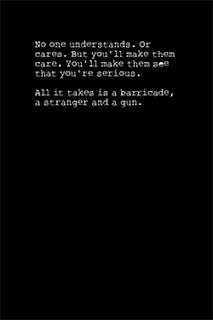 A light hearted, light weight game set in a grim yet Gonzo post apocalyptic future teeming with mutations and, errrr, guns. It is also comes in a pocketmod format. It's also in Spanish and French. It is a delight to read and leaves you wanting more but like all lightweight games, is there enough here to make it a game? Characters have four attributes: Combat, Physical, Mental, Social; 8 points divvied up, maximum 3, minimum 1. 3 races: Pure Human, Mutant Human, Evolved Animal; decides hit points and mutation. Mechanics: Sum 2D6 and attribute, succeed if large than a target number. Critical fail on rolling a 2, critical pass on 12. When attacked, target number is 9 by default and called Defense. Experience between 1 to 3 depending on adventure difficulty, spend it on hit points, Defence or abilities. For combat initiative, sum 2D6 and combat, highest goes first. That's the majority of the mechanics. I wanted to see if I could be more succinct than the game without losing meaning. I'll let you be the judge of that, dear reader! Those mechanics are common but that's OK because they make way for the interesting stuff. Mutations! Who wouldn't want them? Telekinesis can be fun in a cafe, extra arms lets you quad-yield SMGs and Dual Brain doubles your mental power. And there are more. Not lots more; enough for characters to be individual. 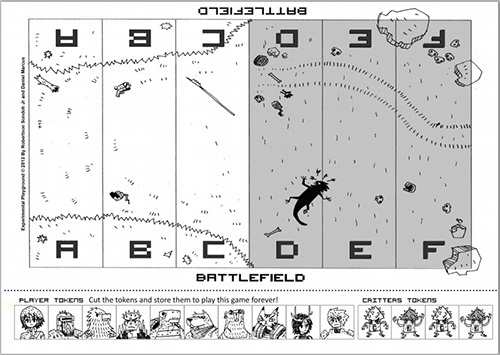 In combat, you are confined to a linear map (see picture). This sounds awful but it allows there to be a tactical choice without resorting to the complexity of grids or hex systems. A clever balance of enough map to be tactical but not so much that you need to create mechanics for dealing with it. If you ever wondered "how do I cater for maps in my super-lightweight RPG" then this is it. The specter of radiation pops up as a check against your physical attribute. If you fail, you get some radiation points. Radiation kills humans and mutates mutants before killing them. It's nasty stuff. 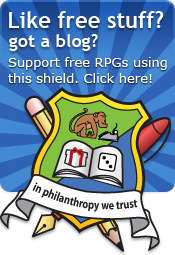 Who says that roleplaying games can't be used to teach people about the real world! Lightweight games do the same to me as a single bite of chocolate. It melts into your brain, you get the sugary endorphin rush and then you crave more. I crave more of Mutants and Machineguns. I want a game world. I want more critters. I want more of the delightful art. There is more than enough game here to make it a game I just want more. Gonzo Post-Apocalypse is such a superb idea (Fear and Loathing in Fallout?) that is demands expansion. Expansion without losing the essence of being a small game. That's a huge demand - but a worthwhile one. 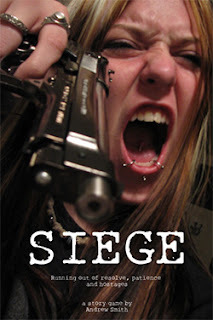 Siege is a one shot story game where the players play all the parts in a hostage situation: Captor, Hostage and Police. Negotiate peacefully or waste the hostages. Make peace with the captors or nuke them from orbit. Feed the media circus or shut them out. Overpower your captor or reason with them. Moral ambiguity is explicit: cops can be bribed, the captor is following a good cause, the hostages are villains. It's got tight, emotive focus but does it work as a game? With smaller number of players, the GM is both hostage and GM. With more players, roles are added in order. Your character has two Resistances: Patience, Resolve and 2 Abilities: Wit and Action. Patience and Resolve measure how emotional fatigue drains out of your character through the story. Wit and Action are more like traditional Attributes intelligence and strength-dex-etc. You then pick a core expertise, which outlines the sort of things that you character can do (without being too broad). These add modifiers to checks when you use them. Examples for the police include sniper or negotiator. This is a public area of expertise, you also get to have two secret ones that you can reveal at any time. The GM is final arbiter, ensuring the chosen areas are not too broad. The Captor character gets to choose why they took hostages. The GM and player playing the Captor work together to set this up in secret. Like all good movie hostage situations, this reason will be revealed at some point for dramatic effect. The GM establishes a scene and the players take it in turns to narrate what they are doing. Scenes can be proposed by players too. This continues until a character performs an action that can be opposed by another character. This is called a decision point. Actions are resolved by rolling 3D6. Choose the relevant action statistic and pick up that many D6s. You then add one die for Resolve and one for Patience. Roll them all. 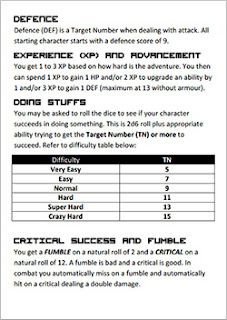 Choose the highest die and add modifiers. Highest score wins. 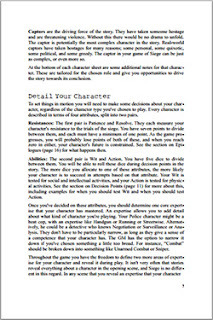 If rolling against a non-player then 6 or more progresses the story in the character's favour (player narrates). Less than 6 and the GM gets to choose. Wounding is descriptive with a modifier to future actions. The Patience and Resolve dice need to be coloured differently. If you roll 1 on one of these dice, the relevant score decreases by one. This is how you run out of Patience or Resolve. That's exceptionally neat. Are we in a relationship? Sympathy is a statistic that charts how characters feel toward each other between +2 and -2. Sympathy is used to modify checks. If you have negative Sympathy for the Captor and perform an action against them, you get a bonus. I like the idea but getting my brain round the positive/negative strength took a while. Using Twists, Siege allows you to change roles halfway through the game. Brilliant. When a character runs out of Patience, they can only make Action tests (lost their wits) and when they run out of Resolve, their next scene must be their last. Bleeding resolve will force the game to end through narrative. Tracking Patience and Resolve in this way brings the game to life. The game is well written throughout, although the language at times is a little "happy-jolly" for the subject matter, I would keep it grittier. I would opt for a smaller font, two columns and a narrower margin. This would considerably reduce the page count, and shorter line lengths will make it easier to read. I would move the page numbers to the middle (no need for facing pages as there is no spine-friendly background). I would put rules in boxes to make them easier to refer to. The credited imagery is very well chosen (a superb front cover), I would perhaps use smaller images and let text flow around them. The examples are well labelled as such (being indented) but I would like to see some more of them - especially around basic actions and the end-game. As the GM is used as a final source of ideas in many cases, I would include a bunch of inspiration lists. Andrew has done this for "Why take hostages" and it works brilliantly. Siege is crafted to be an intense experience for players with their serious heads on. The core novel mechanics of Patience and Resolve ultimately drive the story. Siege is a blank canvas for the GM to seed ideas for the team, so preparation is required. It's a one-shot that should be savored. A single lamp in a dark room, a soundtrack of crickets and then dig deep to find your own moral compass. You might get flashbacks from it days after but then that's what makes it worthwhile.